Extend Studio have kindly sponsored 3 licenses that will be given away to readers of tripwire magazine. All you have to do to participate is to retweet this article and leave a comment Twitter status url before 06/08/2009. More details below. CSS Menus is a website set up to show how CSS can be used to style unordered lists and turn then into stylish, professional menus that would enhance the look of any website. Site offers dozens of CSS menus split into following sections: Single Level Menus, Dropdown Menus, Dropline Menus and Flyout Menus. Navigation menus have really important role in any website. For big sites full with a lot of pages and articles, drop down menus and tabs are popular because they can make it a lot more easier to navigate and move through site, also you can save space on website displaying content on dynamic tabs. Also if you want to create a navigation menu, that really stands out of the crowd, jQuery could be the right choice to choose offering bunch of customizable options. 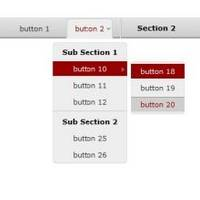 That?s why I present to You 36 really good jquery navigation menu examples for every need.